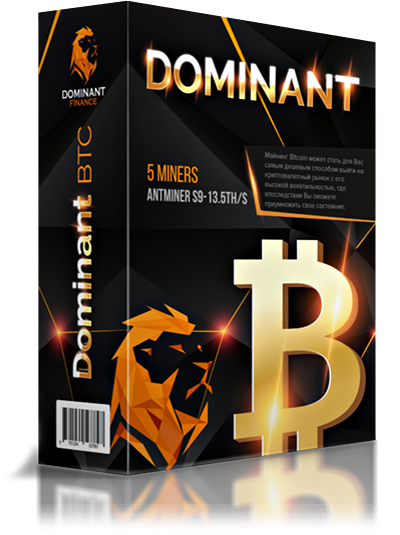 Dominant Finance is a modern investment and mining company, which is based on a fully open and ready-to-grow platform, built on the principles of production and daily distribution of crypto-currency among all participants. We offer you to become a co-owner of mining equipment, excluding all technical difficulties. 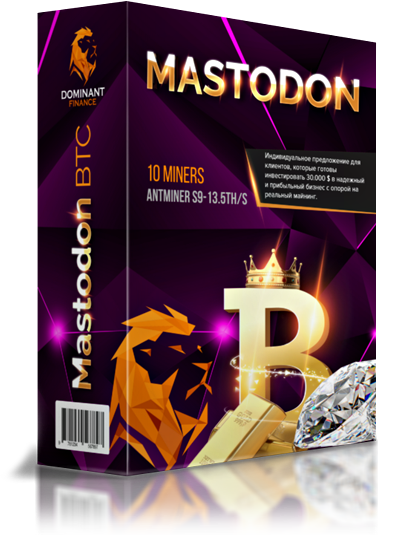 With us you get absolutely transparent and reliable information about the work of each launched miner and the payment received from the mining pool. 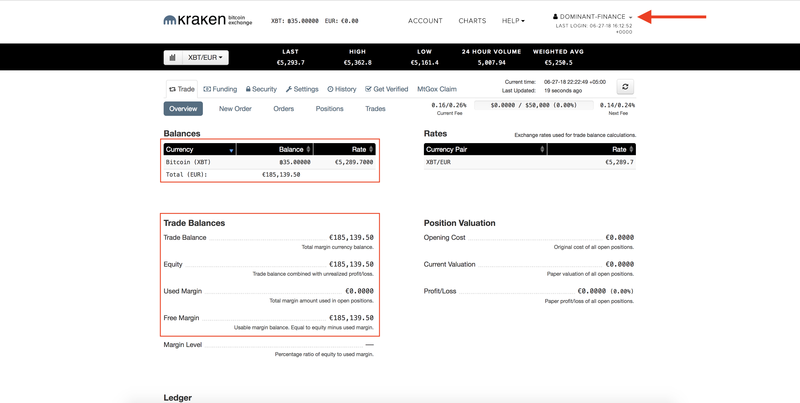 Our second specialization is the management of the extracted crypto assets at the largest exchanges in terms of liquidity and reliability rating: Binance (Shanghai, China), Bittrex (New York, USA), Kraken (San Francisco, USA), Poloniex (Delaware, USA). We publish reports on all our trades, comment and explain each decision taken, you look behind our actions and see indicators of real trade. Dominant Finance is your own business where your investments work in a transparent scheme and are loaded into a tool that generates crypto currency in front of your eyes. The Dominant Finance team consists of 5 professional developers and managers, with each of whom you can contact via Facebook or Telegram. 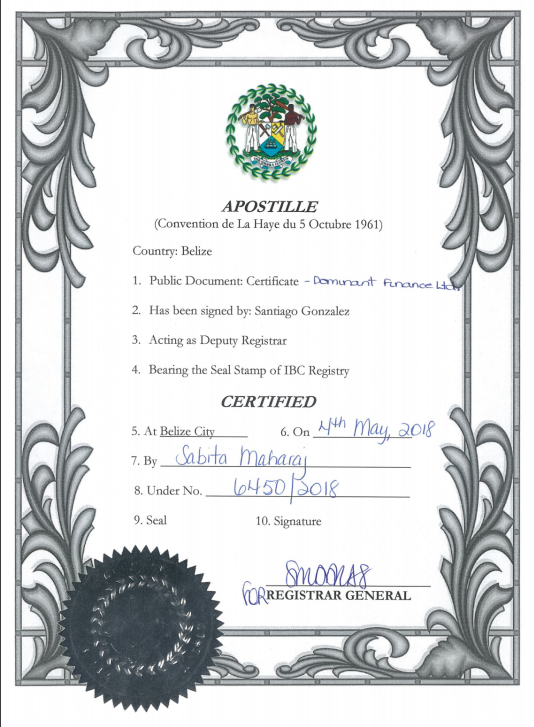 For reliable work in different countries, Dominant Finance was registered in 5 jurisdictions at once in accordance with local legislation, providing customers with a wide geographical presence throughout the world. As the insurance fund, the company president Thomas Eklund was paid a cash deposit of $ 1,000,000, guaranteeing customers compensation for losses in the event of unforeseen risks. In the investment business, this is an unprecedented step towards the openness and transparency of the company's activities, which is intended to officially confirm the financial viability of Dominant Finance and the absolute willingness to satisfy any client request for withdrawal of funds. The company's investment proposals are based on real business and are formed in the form of ready-made packages that have a certain cost and parameters for which services are provided and the extracted crypto-currencies are distributed. 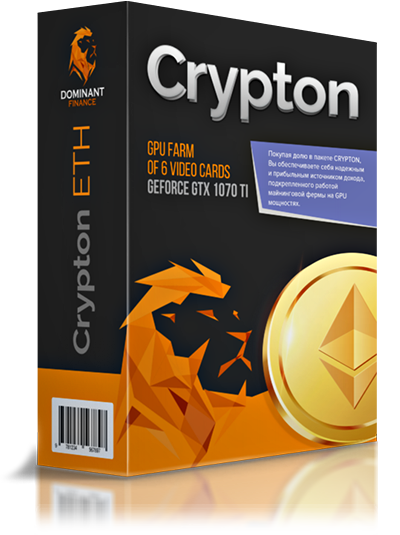 In this package, an investment pool of $ 8,000 is being created to run the GPU of the farm, which consists of six top-end GeForce GTX 1070 Ti video cards. 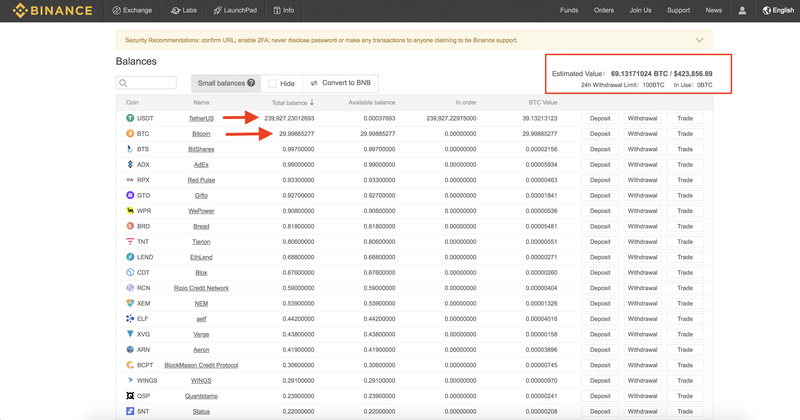 Log into the pool from $ 10 to $ 8000, the period of work is 400 calendar days, the yield is floating: 0.27-0.47% per day, 8-14% per month, 107-187% for the period. 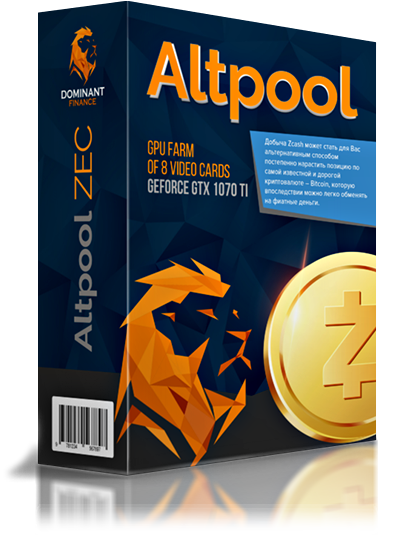 In this package, an investment pool of $ 10,000 is being created to launch a GPU farm consisting of 10 top-end GeForce GTX 1070 Ti graphics cards. The entrance to the pool from $ 50 to $ 10,000, the period of work is 400 calendar days, the profitability is floating: 0.3-0.53% per day, 9-16% per month, 120-213% over the period. In this package, an investment pool is being formed in the amount of $ 15,000 for the purchase and launch of 5 professional ASIC miners Antminer S9-13.5TH / s from Bitmain, the most famous producer of equipment for mining. Log into the pool from $ 100 to $ 15,000, the period of work is 400 calendar days, the yield is floating: 0.33-0.60% per day, 10-18% per month, 133-240% over the period. This is an individual offer for customers who are willing to invest $ 30,000 in a reliable and profitable business with reliance on real mining. At $ 30,000, 10 high-performance ASIC miners Antminer S9-13.5TH / s will be purchased, which will generate Bitcoin for you for 400 days. Profitableness floating: 0.37-0.67% per day, 11-20% per month, 147-267% for the term. Since you can invest and withdraw funds in the Crypto currency (without recalculation into classical currencies), you can receive an additional percentage of the profit due to its organic growth. If you convert the crypto currency in time to fiat money in time, the payback period of your investments can naturally be halved, and the profit, respectively, will increase. How technically is the investment of funds in Dominant Finance? Step 1: Select the desired package and register your personal cabinet. Step 2: Refill the transit account using the currency and system convenient for you. 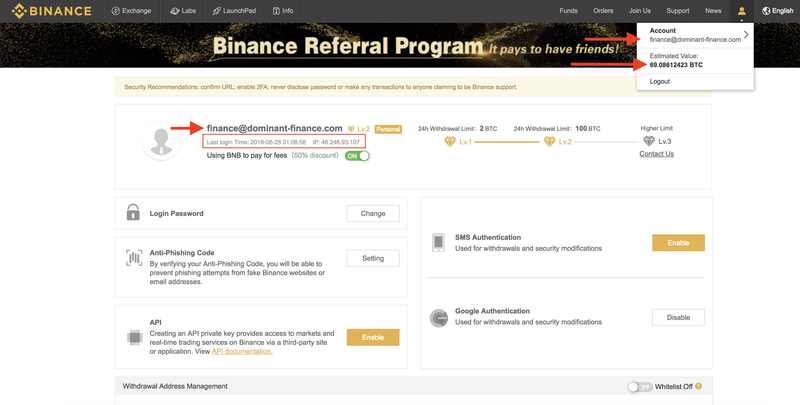 Step 4: After you complete the formation of the pool on the investment package you paid for, you will see the status of "Purchase" in your personal account; after the purchase of mining equipment, we begin its installation, configuration and connection, and you will see the status of "Setup"; after the equipment is configured and connected to the account in the mining pool, you will see the status of "Mining started", from that day your investment starts to work. On average, the procedure of activation of the investment package takes from 3 to 6 days. Step 5: Every day at 18:00 (GMT + 3) you will receive profit on your personal account in the same currency and system with which the package was paid. The body of the deposit in Dominant Finance is an investment asset that operates according to a specific strategy, in which the actually purchased mining equipment appears. As long as the strategy is active, the invested funds must remain part of the strategy. Thus, the deposit body is not subject to early withdrawal, and in addition - it is included in daily charges. In the company Dominant Finance, you can replenish the account for any amount. The minimum amount of replenishment of the account is not provided. 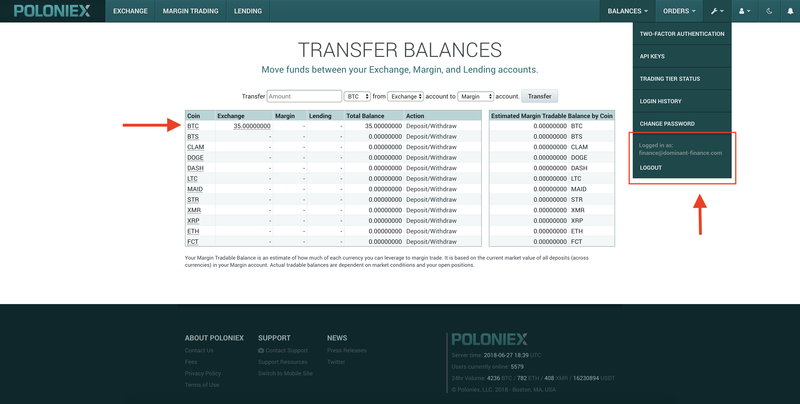 The withdrawal of funds opens every Sunday at 15:00 (GMT + 3). The minimum withdrawal amount is only 5 USD (or the equivalent amount in another currency). The maximum withdrawal amount is unlimited. 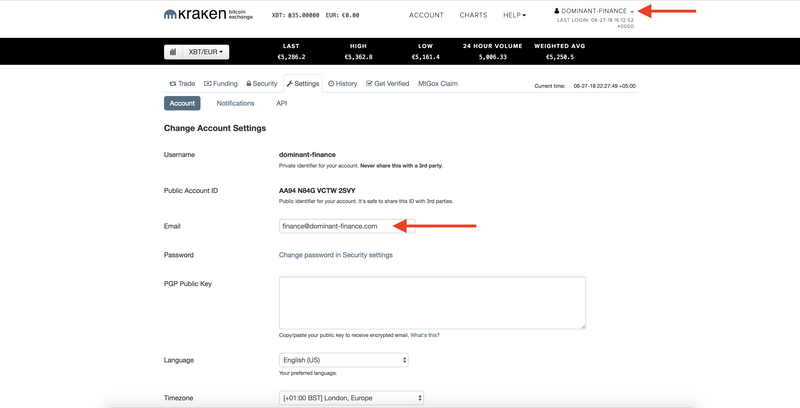 Withdraw any amount from your account! The affiliate program of Dominant Finance includes 15 career levels (statuses), on which depends, what bonuses and in what amount you will receive. Pay attention to the conditions that must be fulfilled for the transition to a new career level, which helps increase your income. This career program is designed so that active partners have an increased interest in working with their clients, whose promotion directly affects their income. Also, as part of the marketing plan, you can participate in the "Race of Diamonds" competition and collect several expensive prizes worth hundreds of thousands of dollars. The status is assigned to any registered user of the company. || To receive rewards in the status of the Partner, a personal investment is not required. The status is assigned when the structural turnover reaches $ 2500 and personal investment from $ 50. The status is assigned upon reaching a structural turnover of $ 10,000 and a personal investment of $ 500. 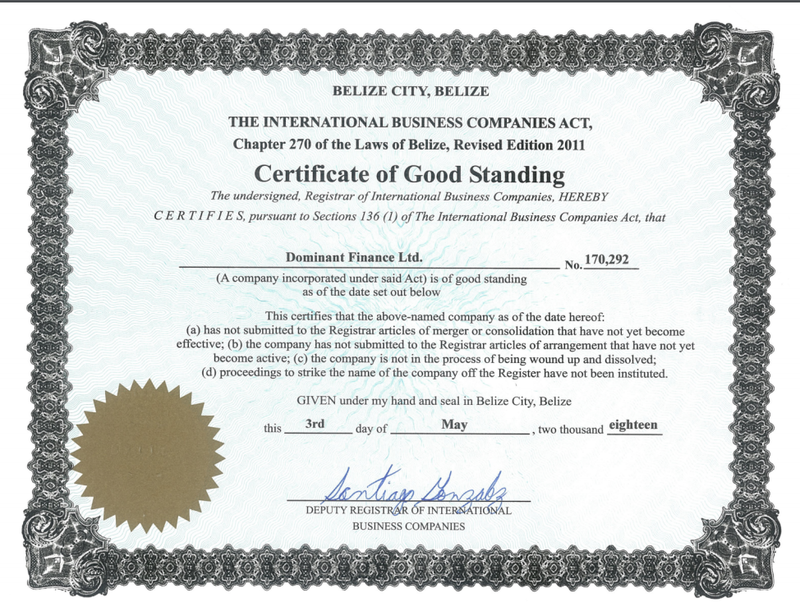 The status is assigned upon reaching a structural turnover of $ 25,000 and a personal investment of $ 1,000. || To receive a Career Bonus in the status of the Agent, you must have two personal partners in the status of Junior Agent or higher. The status is assigned when the structural turnover reaches $ 75,000 and personal investment from $ 2500. || To open an office and receive a Career Bonus in the status of Senior Agent, you must have two personal partners in the status of Agent or higher. The status is assigned upon reaching a structural turnover of $ 150,000 and a personal investment of $ 5,000. || To obtain the Antminer S9-13.5TH / s miner and the Career bonus in the status of the Manager, you must have two personal partners in the status of Senior Agent or higher. The status is assigned upon reaching a structural turnover of $ 350,000 and a personal investment of $ 10,000. || To obtain the GPU of the farm and the Career Bonus in the status of Sapphire, you must have two personal partners in the status of Manager or higher. The status is assigned when the structural turnover reaches $ 700,000 and personal investment from $ 20,000. || In order to receive a VIP ticket for the Leaders Congress and a Career Bonus in the status of Ruby, you must have two personal partners in the status of Sapphire or higher. The status is assigned upon reaching a structural turnover of $ 1,500,000 and a personal investment of $ 40,000. || To get a free trip to Dubai and Career Bonus in the status of Emerald, you need two personal partners in the status of Ruby or higher. The status is assigned upon reaching a structural turnover of $ 3.000.000 and a personal investment of $ 60.000. || To receive a Career bonus in the status of a Diamond, you must have two personal partners in the status of Emerald or higher. The status is assigned upon reaching a structural turnover of $ 5,000,000 and a personal investment of $ 80,000. || To receive a Career bonus in the status of Diamond (1 carat), you must have two personal partners in the status of Brilliant or higher. The status is assigned upon reaching a structural turnover of $ 7,000,000 and a personal investment of $ 100,000. || To receive a Career Bonus in the status of Diamond (2 carats), you must have two personal partners in the status of Brilliant (1 carat) or higher. The status is assigned upon reaching a structural turnover of $ 10,000,000 and a personal investment of $ 150,000. || To receive a Career Bonus in the status of Brilliant (3 carats), you must have two personal partners in the status of Brilliant (2 carats) or higher. The status is assigned upon reaching a structural turnover of $ 15,000,000 and a personal investment of $ 200,000. || To receive a Career Bonus in the status of Diamond (4 carats), you need two personal partners in the status of Brilliant (3 carats) or higher. 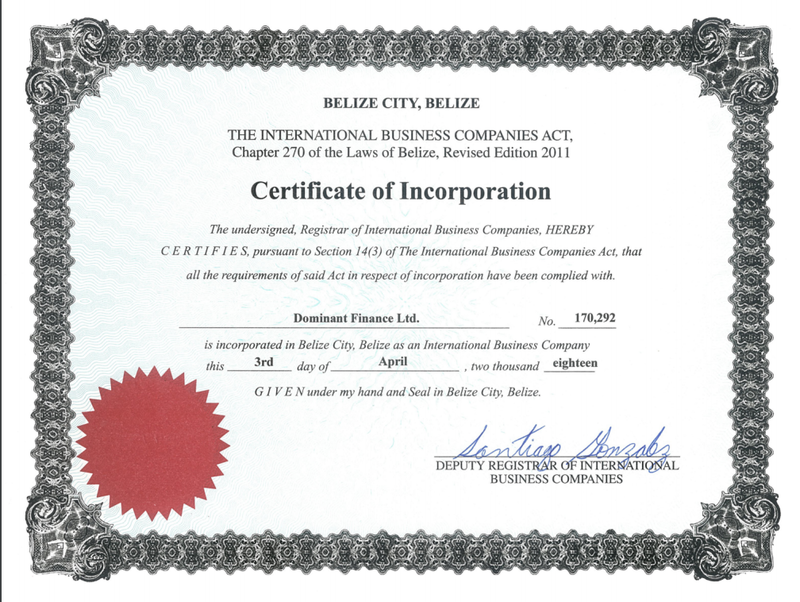 The status is awarded when reaching a structural turnover of $ 20,000,000 and a personal investment of $ 300,000. || To receive a Career Bonus in the status of Diamond (5 carats), you must have two personal partners in the status of Diamond (4 carats) or higher. For partners participating in the race of diamonds, Mercedes-Benz cars are sported in a sport package from the tuning studio AMG, as well as car brands specializing in the production of elite sports cars. Structural turnover is an accumulative system that takes into account a certain percentage of all investments in your structure to an endless level. So, if you have already accumulated the sum of the structural turnover of $ 10,000 and you were given the status of Junior Agent, to obtain the next status of the Agent ($ 25,000) you only need to save the remaining amount of $ 15,000. This algorithm works equally throughout the career ladder, which is clearly visible in the personal cabinet of each partner of the company. A direct bonus is a reward that is charged in a certain amount from investments in your structure. Let's consider on a concrete example, what average monthly income you can receive on the Direct bonus in the status of the Senior agent. 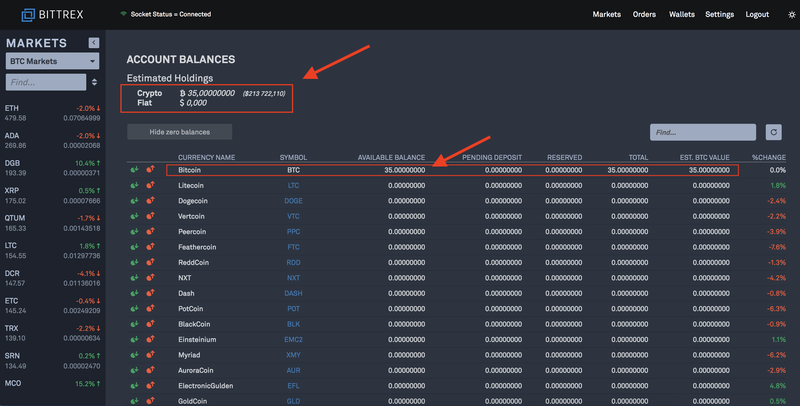 Let's say that for the entire month you personally managed to attract the amount of investments of only $ 14,700, from which you received 8%, that is 1176 $. Already a good result. But the most interesting is ahead, because your whole structure works for you. Now it is important to understand what kind of income you received from the attracted investments by your partners in the statuses Agent, Junior Agent and Intern. For example, this month your partners in the status of the Agent attracted the amount of investments $ 37,350 and their profit on the Direct Bonus was 7%, that is $ 2,614.5. To calculate your income, you need to deduct the difference in interest on the Direct Bonus between your status (Senior Agent - 8%) and the status of these partners (Agent - 7%), which is 1%. Thus, your income from the work of partners in the status of the Agent was 1%, that is 373.5 $. Next, let's see what income you got from the work of your partners in the status of Junior Agent. This month, they attracted an investment of $ 45,800 and earned a Direct Bonus of 6%, that is, $ 2,748. Now, subtract the difference between your status (Senior agent - 8%) and the status of these partners (Junior agent - 6%), which is 2%, and we will receive your income of $ 916. And now let's see what income you got from the work of your partners in the status of Trainee. This month they attracted an investment of $ 19.200 and their income on the Direct Bonus was 5%, that is, $ 960. Traditionally we subtract the difference between your status (Senior agent - 8%) and the status of these partners (Trainee - 5%) and see that your income from the work of partners in the status of the Trainee was 3%, that is, $ 576. It remains for us to add up all the amounts received by you, after which we will see that your income for the previous month under the Direct Bonus was $ 3,041.5. Undoubtedly, this is a delightful result, but it is far from the best that a partner can expect in the status of a Senior Agent, using the excellent marketing plan Dominant Finance. In addition, think about the fact that we have considered the example of your average monthly income only from the work of partners of the first level. But you can also receive income in general from every investment that your partners are attracted to the company, absolutely at any level indefinitely. Your income is calculated as the difference in interest on the Direct Bonus between your status and the status of any of your partners. One simple example: Your career status Sapphire (10%), at the first level in your structure there is a partner in the status of Senior Agent (8%), at the second level the partner in the status of Junior Agent (6%), at the third level partner in the status of Trainee (5%). If the partner in the status of the Trainee attracts an investment of $ 10,000, he will receive 5% ($ 500), the partner in the status of Junior agent will receive 1% (6% - 5% = 1%, that is $ 100), partner in the status of Senior Agent will receive 2% (8% - 5% - 1% = 2%, that is $ 200), and you will also receive 2% of this amount (10% - 5% - 1% - 2% = 2%, that is 200 $). Just imagine what income you can get from the work of your partners in the depth of the structure. Your income under the Direct Bonus can be unlimited, and with each month it will increase as your structure grows. Contribution - 07.27.18 12:23 Account Transfer -100.00 Sent Payment: 100.00 USD to account U16345196 from U4095553. Batch: 222331626. Memo: Shopping Cart Payment. Account Replenishment of Dominant Finance.